Women There are 153 products. Let everyone know you're the #1 Vegas Golden Knights fan when you sport this Authentic Adidas Women's Alex Tuch Vegas Golden Knights Home Jersey - Gray! The perfect complement to your Vegas Golden Knights wardrobe, this jersey is sure to turn heads. Let everyone know you're the #1 Vegas Golden Knights fan when you sport this Authentic Adidas Women's Brayden McNabb Vegas Golden Knights Home Jersey - Gray! The perfect complement to your Vegas Golden Knights wardrobe, this jersey is sure to turn heads. Let everyone know you're the #1 Vegas Golden Knights fan when you sport this Authentic Adidas Women's Clayton Stoner Vegas Golden Knights Home Jersey - Gray! The perfect complement to your Vegas Golden Knights wardrobe, this jersey is sure to turn heads. Let everyone know you're the #1 Vegas Golden Knights fan when you sport this Authentic Adidas Women's Cody Eakin Vegas Golden Knights Home Jersey - Gray! The perfect complement to your Vegas Golden Knights wardrobe, this jersey is sure to turn heads. Let everyone know you're the #1 Vegas Golden Knights fan when you sport this Authentic Adidas Women's Colin Miller Vegas Golden Knights Home Jersey - Gray! The perfect complement to your Vegas Golden Knights wardrobe, this jersey is sure to turn heads. Let everyone know you're the #1 Vegas Golden Knights fan when you sport this Authentic Adidas Women's Custom Vegas Golden Knights Home Jersey - Gray! The perfect complement to your Vegas Golden Knights wardrobe, this jersey is sure to turn heads. Let everyone know you're the #1 Vegas Golden Knights fan when you sport this Authentic Adidas Women's Deryk Engelland Vegas Golden Knights Home Jersey - Gray! The perfect complement to your Vegas Golden Knights wardrobe, this jersey is sure to turn heads. Let everyone know you're the #1 Vegas Golden Knights fan when you sport this Authentic Adidas Women's Erik Haula Vegas Golden Knights Home Jersey - Gray! The perfect complement to your Vegas Golden Knights wardrobe, this jersey is sure to turn heads. Let everyone know you're the #1 Vegas Golden Knights fan when you sport this Authentic Adidas Women's Jon Merrill Vegas Golden Knights Home Jersey - Gray! The perfect complement to your Vegas Golden Knights wardrobe, this jersey is sure to turn heads. Let everyone know you're the #1 Vegas Golden Knights fan when you sport this Authentic Adidas Women's Jonathan Marchessault Vegas Golden Knights Home Jersey - Gray! The perfect complement to your Vegas Golden Knights wardrobe, this jersey is sure to turn heads. Let everyone know you're the #1 Vegas Golden Knights fan when you sport this Authentic Adidas Women's Malcolm Subban Vegas Golden Knights Home Jersey - Gray! The perfect complement to your Vegas Golden Knights wardrobe, this jersey is sure to turn heads. Let everyone know you're the #1 Vegas Golden Knights fan when you sport this Authentic Adidas Women's Marc-Andre Fleury Vegas Golden Knights Home Jersey - Gray! The perfect complement to your Vegas Golden Knights wardrobe, this jersey is sure to turn heads. Let everyone know you're the #1 Vegas Golden Knights fan when you sport this Authentic Adidas Women's Nate Schmidt Vegas Golden Knights Home Jersey - Gray! The perfect complement to your Vegas Golden Knights wardrobe, this jersey is sure to turn heads. Let everyone know you're the #1 Vegas Golden Knights fan when you sport this Authentic Adidas Women's Oscar Dansk Vegas Golden Knights Home Jersey - Gray! The perfect complement to your Vegas Golden Knights wardrobe, this jersey is sure to turn heads. 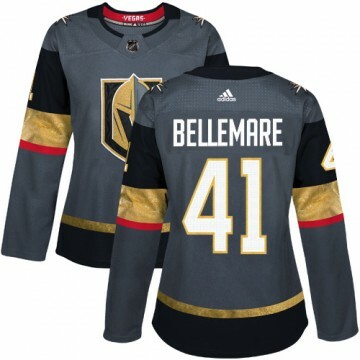 Let everyone know you're the #1 Vegas Golden Knights fan when you sport this Authentic Adidas Women's Pierre-Edouard Bellemare Vegas Golden Knights Home Jersey - Gray! The perfect complement to your Vegas Golden Knights wardrobe, this jersey is sure to turn heads. 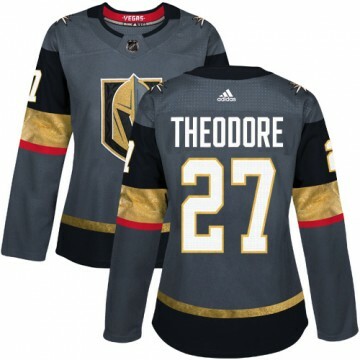 Let everyone know you're the #1 Vegas Golden Knights fan when you sport this Authentic Adidas Women's Shea Theodore Vegas Golden Knights Home Jersey - Gray! The perfect complement to your Vegas Golden Knights wardrobe, this jersey is sure to turn heads. Let everyone know you're the #1 Vegas Golden Knights fan when you sport this Authentic Adidas Women's Tomas Nosek Vegas Golden Knights Home Jersey - Gray! The perfect complement to your Vegas Golden Knights wardrobe, this jersey is sure to turn heads. Let everyone know you're the #1 Vegas Golden Knights fan when you sport this Authentic Adidas Women's William Karlsson Vegas Golden Knights Home Jersey - Gray! The perfect complement to your Vegas Golden Knights wardrobe, this jersey is sure to turn heads. Let everyone know you're the #1 Vegas Golden Knights fan when you sport this Authentic Adidas Women's Alex Tuch Vegas Golden Knights USA Flag Fashion Jersey - Gray! The perfect complement to your Vegas Golden Knights wardrobe, this jersey is sure to turn heads. Let everyone know you're the #1 Vegas Golden Knights fan when you sport this Authentic Adidas Women's Brayden McNabb Vegas Golden Knights USA Flag Fashion Jersey - Gray! The perfect complement to your Vegas Golden Knights wardrobe, this jersey is sure to turn heads. Let everyone know you're the #1 Vegas Golden Knights fan when you sport this Authentic Adidas Women's Clayton Stoner Vegas Golden Knights USA Flag Fashion Jersey - Gray! The perfect complement to your Vegas Golden Knights wardrobe, this jersey is sure to turn heads. Let everyone know you're the #1 Vegas Golden Knights fan when you sport this Authentic Adidas Women's Cody Eakin Vegas Golden Knights USA Flag Fashion Jersey - Gray! The perfect complement to your Vegas Golden Knights wardrobe, this jersey is sure to turn heads. Let everyone know you're the #1 Vegas Golden Knights fan when you sport this Authentic Adidas Women's Colin Miller Vegas Golden Knights USA Flag Fashion Jersey - Gray! The perfect complement to your Vegas Golden Knights wardrobe, this jersey is sure to turn heads. Let everyone know you're the #1 Vegas Golden Knights fan when you sport this Authentic Adidas Women's Deryk Engelland Vegas Golden Knights USA Flag Fashion Jersey - Gray! The perfect complement to your Vegas Golden Knights wardrobe, this jersey is sure to turn heads. Let everyone know you're the #1 Vegas Golden Knights fan when you sport this Authentic Adidas Women's Erik Haula Vegas Golden Knights USA Flag Fashion Jersey - Gray! The perfect complement to your Vegas Golden Knights wardrobe, this jersey is sure to turn heads. Let everyone know you're the #1 Vegas Golden Knights fan when you sport this Authentic Adidas Women's Jon Merrill Vegas Golden Knights USA Flag Fashion Jersey - Gray! The perfect complement to your Vegas Golden Knights wardrobe, this jersey is sure to turn heads. Let everyone know you're the #1 Vegas Golden Knights fan when you sport this Authentic Adidas Women's Jonathan Marchessault Vegas Golden Knights USA Flag Fashion Jersey - Gray! The perfect complement to your Vegas Golden Knights wardrobe, this jersey is sure to turn heads. Let everyone know you're the #1 Vegas Golden Knights fan when you sport this Authentic Adidas Women's Malcolm Subban Vegas Golden Knights USA Flag Fashion Jersey - Gray! The perfect complement to your Vegas Golden Knights wardrobe, this jersey is sure to turn heads. Let everyone know you're the #1 Vegas Golden Knights fan when you sport this Authentic Adidas Women's Marc-Andre Fleury Vegas Golden Knights USA Flag Fashion Jersey - Gray! The perfect complement to your Vegas Golden Knights wardrobe, this jersey is sure to turn heads. Let everyone know you're the #1 Vegas Golden Knights fan when you sport this Authentic Adidas Women's Nate Schmidt Vegas Golden Knights USA Flag Fashion Jersey - Gray! The perfect complement to your Vegas Golden Knights wardrobe, this jersey is sure to turn heads. Let everyone know you're the #1 Vegas Golden Knights fan when you sport this Authentic Adidas Women's Oscar Dansk Vegas Golden Knights USA Flag Fashion Jersey - Gray! The perfect complement to your Vegas Golden Knights wardrobe, this jersey is sure to turn heads.